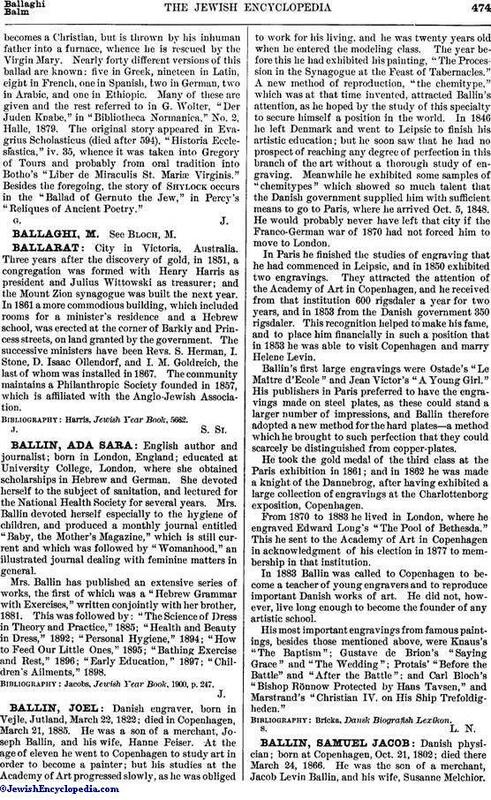 In the folk-poetry of Europe a certain number of ballads deal with Jewish subjects or with Jewish persons. 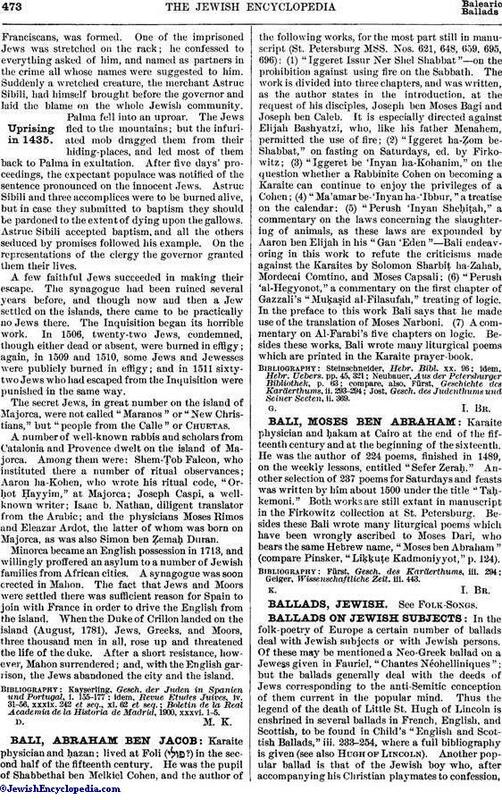 Of these may be mentioned a Neo-Greek ballad on a Jewess given in Fauriel, "Chantes Néohelliniques"; but the ballads generally deal with the deeds of Jews corresponding to the anti-Semitic conception of them current in the popular mind. Thus the legend of the death of Little St. Hugh of Lincoln is enshrined in several ballads in French, English, and Scottish, to be found in Child's "English and Scottish Ballads," iii. 233-254, where a full bibliography is given (see also Hugh of Lincoln). Another popular ballad is that of the Jewish boy who, after accompanying his Christian playmates to confession,becomes a Christian, but is thrown by his inhuman father into a furnace, whence he is rescued by the Virgin Mary. Nearly forty different versions of this ballad are known: five in Greek, nineteen in Latin, eight in French, one in Spanish, two in German, two in Arabic, and one in Ethiopic. Many of these are given and the rest referred to in G. Wolter, "Der Juden Knabe," in "Bibliotheca Normanica," No. 2, Halle, 1879. The original story appeared in Evagrius Scholasticus (died after 594), "Historia Ecclesiastica," iv. 35, whence it was taken into Gregory of Tours and probably from oral tradition into Botho's "Liber de Miraculis St. Mariæ Virginis." Besides the foregoing, the story of Shylock occurs in the "Ballad of Gernuto the Jew," in Percy's "Reliques of Ancient Poetry."